You will be hard-pressed to find more color variation and versatility than with this Bella + Canvas 3001C Unisex Jersey Short Sleeve T-Shirt. With 40 + bright and bold colors to choose from, you are sure to find a match to serve as the perfect background for your printed work of art. 30 singles thread width is narrow and tight enough to meet the functional requirements of a canvas for heat and silk printing. The unisex design means that the whole team can match, as the shirt is flattering for both sexes. Men and women will both be pleased with the shorter, fitted bicep cuff that adds just a bit of an enhanced look versus looser tees. 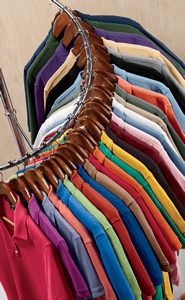 Although the color determines the exact ratio of ring spun cotton and polyester, each shirt is still designed with a higher percentage of chief value cotton to maximize softness, and a quality blend of polyester to remain strong.